VMware vSphere 6.7, 6.5, 6.0 or 5.5 with ESXi and vCenter course books:Includes 741 page VMware vSphere 6 with ESXi and vCenter Study Guide and 243 page Lab Guide. Each item ordered includes one book set. 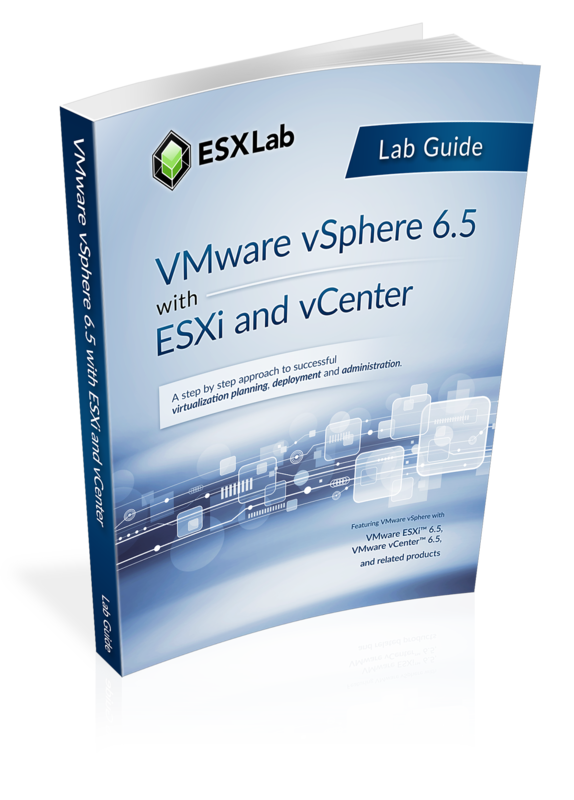 Priority 5-day Hands-on Lab Rental:Turnkey, dedicate lab rental for student use during their VMware vSphere 5.x or 6.x with ESXi and vCenter class. Each item ordered includes one lab rental. VMware vSphere 6.7, 6.5, 6.0 or 5.5 Boot Camp Supplement course book:Get 10 additional class hours of training from our 150 page Boot Camp supplement. It includes an additional 110 slides and 40 pages of additional labs in 4 chapters. Free access to recorded lectures:Improve student learning with free, lifetime acceess to recorded lectures of their class. Course books are delivered directly to your students as discretely watermarked digital/PDF documents. Labs are released to your instructor one business day before the start of your class. We need at least one business day advanced notice to provision and release your books and labs. Your combined Book and Lab purchase provides your student with everything they need to participate in your training event. Add an instructor, a venue and internet connected PCs to complete your class setup. Order one item for each student in your class (so set the quantity to 7 if you have a 7 person class). We will reach out to you after you complete your order to get these details. We offer refunds (upon request) for books not downloaded or labs not used. This way, you never pay for no-show students. To claim your partial refund, please e-mail us with your event details (start/end date, instructor name and the number of books and/or labs you wish refunded). We will check our download/lab usage records and refund the unused books/labs back to you. Each student receives access to a server pod... A server Pod is a set of one or more virtual servers organized into a dedicated, private lab environment. We have sufficient facility to comfortably support 150+ learners concurrently - with no slow downs or resource contention. Our labs are dedicated to each customer (not shared) and are available 24hrs/day during the lab rental period.